in 2005 chanel 4 made him a tribut and they talk about his carrer and, in some way, introduce him to the spanish public. We were invited to sing two songs for him to give the surprise and welcome. I remember being asked to sing the famous song of “The King” of the composer Jose Alfredo Jimenez and do not remember the other. Felipe was who sang the song this time amidst all the nerves that we had to be with Alejandro, such an important figure in our Mexican music. Alejandro is the son of Vicente Fernandez , who is probably the living ranchero singer that has had more importance in Mexico. He began his career at an early age. At four years he sang in public for the first time and worked as an actor with his father in some Mexican films. At eighteen, he recorded the song “Love of the two” which was a great success and two years later he made his official presentation as an artist with his album “Alejandro Fernandez” under the record label SONY musics . 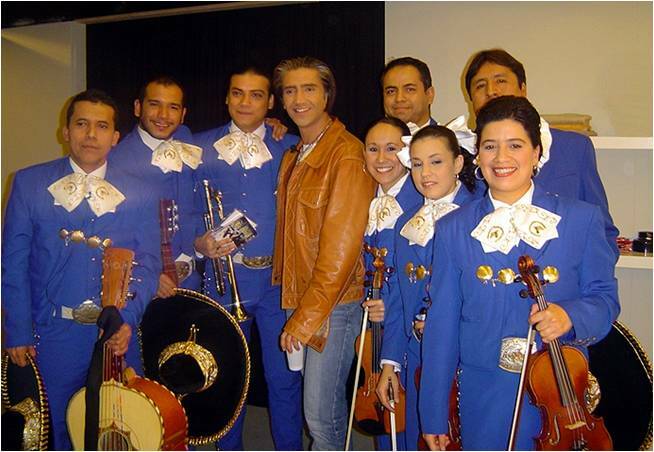 Alejandro Fernandez in his career has had great and distinguished achievements, he has been nominated four times at the Grammys and won two awards; he has won twice at the Festival of Viña del Mar and he even has a star on the Walk of Stars in Hollywood. He has the tourism ambassador appointment of the state of Jalisco for his work promoting our country’s culture and traditions of his state of the Republic. Alejandro has about 30 albums released and has performed and collaborated with many artists such as Plácido Domingo , Beyoncé , Jose Luis Perales , Christina Aguilera , Gloria Estefan and many others live and in recordings. So you can understand the nerves that we had at the moment of playing for him and meet him and live together for a while. I remember his words of praise for us because he had not expected a large and organized group in Catalonia, and congratulated us on our interpretation and encouraged us to continue working to strengthen the path of a mariachi in Spain.